One of my favorite things about the city is that every neighborhood has its own unique energy. If I could, I would try living in every zip code for a full year to submerge myself in the culture. The Upper West Side not only offers a close proximity to Central Park but also a wide array of uncommon eating and drinking options. e’s Bar (511 Amsterdam Avenue) The best vibe award goes to e’s Bar. You’ll only hear tunes from 1960 to 1999 and after 6 p.m., plan your date night because no kids are allowed. Full of board games to borrow, you’ll actually see people playing Jenga or Connect Four. Happily missing is a room full of people basking in the glow of their cell phones. The burgers are a delightfully juicy cross between Corner Bistro and J.G. Melon. Until 7 p.m. Monday through Friday pig out on $5 e’s burgers, $6 beer and well drinks, $7 wine and $8 beer and shot specials. If you need something crispy to go with your beverage choose the shishito peppers or the cup o’ crisp green beans ($6). Gabriela’s Restaurant and Tequila Bar (688 Columbus Avenue) Travel up to 94th Street with or without the strollers to this enormous taqueria. Their Mexican food is authentic plus they have a large covered outdoor area that makes for great people watching. Be prepared to fight for a spot during happy hour from 3-6 p.m. Monday through Thursday for $7.50 margaritas, $5 wines and beer and $4.50 sangria. There are half a dozen food specials offered for $9.50 as well. Do not leave without trying the happy nachos each massively topped with all the fixins. Pick a different margarita each visit to work your way through the menu. Gabriela’s is a fantastic place to celebrate with your friends, family or coworkers. Pizzeria Sirenetta (568 Amsterdam Avenue) I love the deals at this Neapolitan pizza and Italian specialties newcomer. The pizzas are the star but don’t overlook the pastas and salads. It’s best to plan two visits so you can try a little from each part of the menu. Daily from 5-7 p.m. feast on discounted appetizers and drink specials including the chef’s pizza of the day. At the end of your meal get ready for a special treat that makes the evening even more perfect. Try the tomato and fennel sausage pizza and the asparagus, ricotta and Calabrian chili ($18) pies. 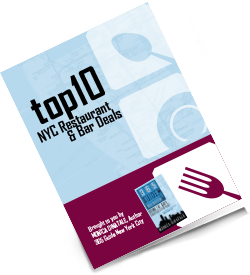 365 Guide New York City is available on Amazon in paperback and ebook and full of restaurant deals and bar specials in NYC.